It almost doesn't matter how you stack 'em up. If you're using pizza ingredients, everyone digs in. 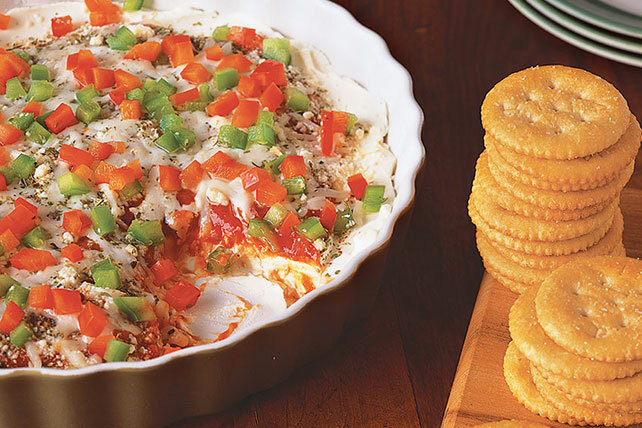 This saucy, cheesy dip with fresh peppers proves the point. Spread cream cheese onto bottom of microwaveable 9-inch pie plate; cover with sauce. Top with layers of all remaining ingredients except crackers. Microwave on HIGH 2 min. or until heated through. Place completely unwrapped package of cream cheese in microwaveable 9-inch pie plate. Microwave on HIGH 15 sec. or just until softened; spread to cover bottom of pie plate, then continue as directed. Serve with assorted cut-up fresh vegetable dippers in addition to the crackers.